If you’re not stuck, your only problem may be that you’re so in the flow that you don’t want stop. But if you do feel stuck, well, that’s where Moving Forward Anyway comes in. Even if there is no deadline, for the reason stated above, Moving Forward Anyway is simply an invaluable action step toward learning how creative you really are. I want to create some original artwork to go above my blue sofa in the living room. 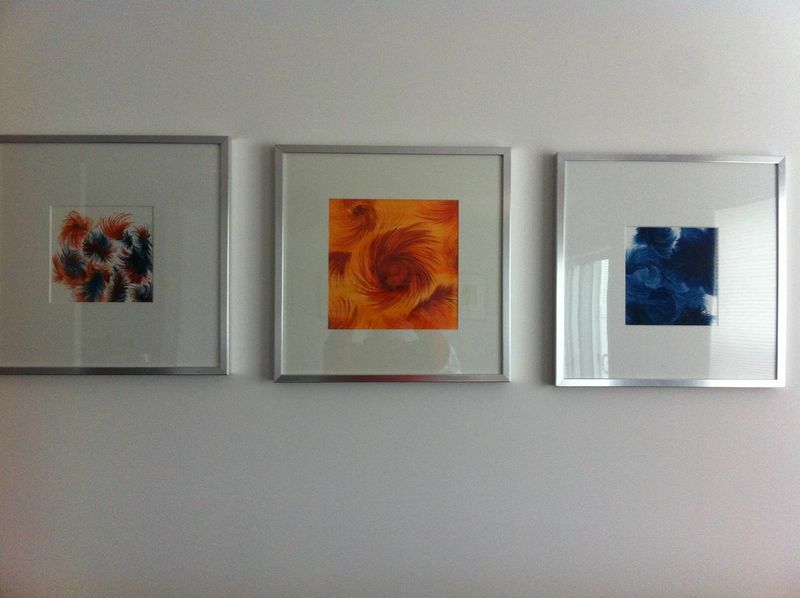 I want the artwork to pick up the colors of my downstairs – blue and orange. I want the three paintings to be based on an interesting single concept. Now, what that concept was going to be, I had no idea. And over the two years that I’ve lived in the townhome, I’ve played around with a bunch of ideas. I love creating word paintings and I thought about doing a concept about my husband’s habit of saying “the word of the day is ____” whenever I use a word that has more than two syllables. In fact, I even went so far as to write a poem called, The Word of the Day is Tenuous. I really like the poem – and I have no artwork based on that concept. I also thought about buying a fourth frame and doing one painting that represents each person in my family – my husband, myself and my two stepdaughters. I also do not have any artwork based on that concept. So, about three weeks ago, my youngest stepdaughter announced that she would like to work on a couple of creative projects for her room over Spring break. I thought, GREAT! This is my chance to finish those #$%&!#*% paintings! We made a plan to go to Michaels to get ideas, and while my stepdaughter proceeded to figure out what she was going to create, I felt even STUCK-ER. I was totally uninspired to watercolor. But what did inspire me was the idea of spending quiet creative time with my stepdaughter. I remembered a song my husband shared about how taking your kid fishing has nothing to do with fishing, and I realized that what was important to me for this particular creative project was Moving Forward Anyway – moving forward so that I would not blow this precious opportunity to create side by side with someone I love. So, in this case, Moving Forward Anyway meant just choosing something – anything – and just doing it. I based choice on my goal of spending time with stepdaughters which meant I just need to mix the colors I wanted and paint something I could paint while focusing on her. We spent two days painting together. She created three watercolor paintings, including a card for her boyfriend and I finished my three pieces for the frames. I really hated my paintings – AT FIRST. After all, there was no big idea behind them like I originally wanted. But now, I absolutely love them – except the one on the left – I still hate that one, but it’s my husband’s favorite. And that is a good enough reason to keep it up on the wall. Because – does it really matter? Was that really the point? I had set my deadline (2 days with my stepdaughter), and I chose to make what I created in that time okay. Un-stucking myself by Moving Forward Anyway on this one project did what Moving Forward Anyway tends to do. It made me feel creative. It made me feel proud. It un-stuck me in general. I received a renewed creative spark for a lot of other projects that had been on my mind. So, whereas this one painting series is not what I wanted to create, Moving Forward Anyway got me more in return than what having a better idea or more inspiration could have possibly given me. It always works that way. If you let it. Never underestimate the value of just deciding to do SOMETHING. Pick your idea out of a hat if you have to, and just follow through and see what transpires. What you actually create is likely the least of what you’ll get. Like me, you may walk away with a deeper appreciation of how creative you really are – and you may find yourself in flow in another place in your life. Even more, you’ll strengthen the deeper “I AM Creative” KNOWING that lives in each of us. The knowing that knows the I’m NOT Creative belief is a lie. Moving Forward Anyway is not a cop out. It’s a legitimate response to a stuck scenario that enables you to create even though you are stuck. Letting go of the outcome and just being in the creative experience is only one of the gifts. What I love so much about those paintings was the process of creating an intimate moment, not a painting. That’s what I think about when I look at them – and that turned out to be the big idea.